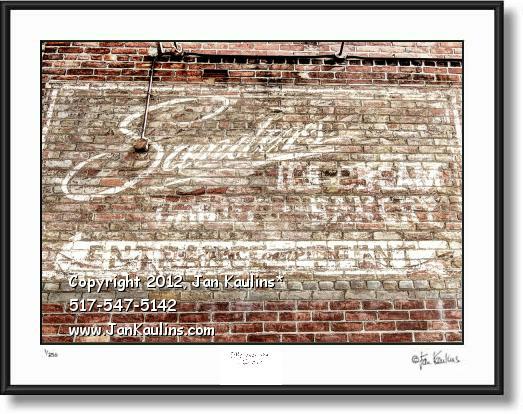 SANDER'S ICE CREAM BAKERY old mural photo picture print photography for sale. This Detroit SANDERS ICE CREAM BAKERY vintage mural sign photo picture print for sale is made from nine bracketed photographic exposures. This rare very vintage fading old sign was found on the back of one of the original Detroit Sanders Ice Cream and Bakery stores on the East Side of Detroit. SANDER'S ICE CREAM, CHOCOLATES, AND BAKED GOODS are a Detroit institution having been around for almost a hundred years. This is a quite rare photo of one of the last remaining old SANDER'S ICE CREAM and BAKERY signs painted on a brick wall from probably around the 1930's---judging by the fading and condition. It is a wonderful historic nostalgic image of this old vintage SANDER'S ICE CREAM BAKERY CHOCOLATE advertising sign photo print for sale. If you look carefully you can still read the bold word SANDER'S and beneath it ICE CREAM AND BAKERY andt then beneath that the white arrow with words reading 'Entrance on Pfent'. Each photograph in this series has been created from nine separate bracketed photographic digital exposures and then layered together into one photographic image. It is then ‘tone-mapped’ where individual areas of the photo, as well as contrast, saturation and other qualities of the image can be artistically manipulated to bring out the artistic effects that make these photos so visually unique and striking. Some of the photos in this series are even further enhanced for artistic effect giving them an almost painterly or graphic silkscreened look.